I just arrived from a weekend of fitness and fun at Boracay with the awesome women of Women’s Health and Summit! I think all women need an annual getaway for us to focus solely on ourselves—our body, mind, and spirit—every once in a while. We flew off to Boracay for the weekend for Women’s Health’s annual event, Beauty and the Beach, the biggest beauty and wellness event in the country. It was also a grand celebration of Women’s Health Philippines’ 5th year anniversary wherein they encouraged women to give themselves a high five for their achievements. I felt fortunate to be invited to Beauty and the Beach again having had a fantastic time there last summer of 2011. Read about it here. So, last Friday, I hopped on my bike trainer (because I wouldn’t be able to ride that weekend), bid the hubby and kids goodbye, and flew off to Boracay for a weekend of fun and fitness! As soon as we arrived and after checking in at Pearl of the Pacific, Women’s Health spared no time in pampering us. Together with Solar news anchor and event host for that weekend Hilary Isaac, we were whisked off to a 90-minute massage at Mandala Spa and Villas. It was my first time there and I loved everything about it from the friendly staff, the ambiance, the clean and well-kept rooms, and, of course, the fantastic massage. I asked for a strong massage and they gave me strong…just the way I like it! We ended the massage just in time for a quick dinner before we got some rest before the real fun began on Saturday. The following day, I got up early for Beauty and the Beach classes by the beachfront. First class: Hatha Yoga! 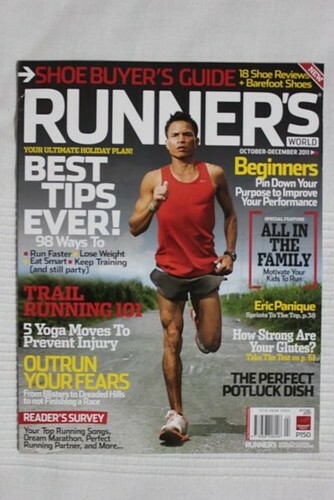 I’m a big fan of yoga especially for runners because we need to loosen up our leg muscles, which take a pounding from all the runs. It’s also great for busy people like me who need to slow down, clear the mind, and simply recalibrate. Second class: Piloxing. The class was taught by the only certified Piloxing instructor in the country, my good friend and roommate for the trip, and also a partner for the Weight Management Sessions we offer at TBR Dream Marathon, Mitch Felipe-Mendoza. Piloxing, as the name suggests, is a mix of Pilates, Boxing, and Dance. I thought it was going to be an easy workout, but boy was I wrong. It was a lung-busting, challenging workout that had me thinking: I would rather be running 21k right now! LOL. Still, it’s always fun to learn new things, to use muscles that are rarely used, and to challenge myself constantly with workouts that I find difficult to do. After lunch at D’Mall, I met up with Women’s Health Editor-in-Chief and triathlete Lara Parpan. We dove into the clear, pristine waters of Boracay and proceeded to swim 1.5k. I had never done laps in Boracay and, as we swam, I couldn’t keep myself from smiling about how fantastic it felt. The water was clean and not too choppy, there was absolutely no jellyfish (we were viewing Ann Curtis’ jellyfish attack photos over lunch! Gaah! ), and I felt that I could go on and on. There are times when I’m reminded of blessed I am to have the opportunity to swim, bike, and run the way I do and this was definitely one of them. By the afternoon, we enjoyed cocktails at Women’s Health’s Chill Out Sunset Party by the beach front. It was an evening to meet other like-minded women of Summit, fashion bloggers, and fitness enthusiasts. More importantly, it was also to congratulate the Women’s Health team for all the great work the past 5 years. – Cheers to the fantastic team of Women’s Health! You girls and guys rock! The next morning, as expected, I got up early to run on the white sand of Boracay. Hey, no trip is complete without a run, right?! Running on sand is always a tricky situation; it’s unstable and soft. My light and minimalist Nike Free Run 2 was perfect for the job. It was hot and humid, but running with that beautiful scenery before me was just a delight. I just enjoyed every moment. The next classes for Beauty and the Beach were the Flirty Girl Fitness and Pound Workout. I have two left feet so I decided to spare the rest of the women from watching me make a fool of myself. It looked like so much fun though! This is just even more proof that there are limitless ways to get fit while having fun. Oh, aside from fitness, Women’s Health treated women to free mani/pedi and hair braiding services at their Beauty Dome by the beach. I would’ve wanted to get my nails done, but I think I was just too excited to maximize my workouts while in Boracay. I guess you could say I’m a pawis (“sweat”) over pampering kinda girl. Hah! Before we knew it, we were bidding each other goodbye as the event came to a close. It was great to make new friends, learn new fitness workouts, swim and run in Boracay, and just have the opportunity to get away from the daily grind. Thank you so much to Women’s Health for the great weekend. High five to all of you! 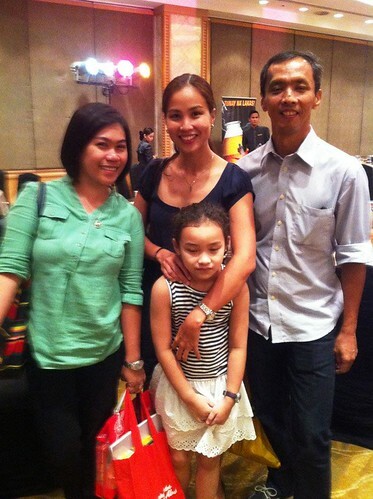 Little Miss Bull Runner and I attended the Press Conference for Cobra Ironman 70.3. She hated her dress so she was not in the best of moods. On the other hand, I couldn’t help but contain my excitement for this highly anticipated race. 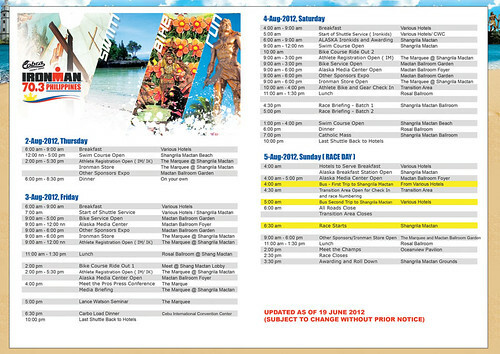 Hope to see you in Cebu on August 4-5, 2012! Here’s more info about the upcoming race. See you there! 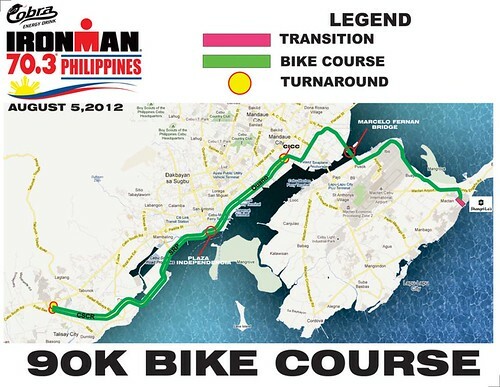 The Cobra Energy Drink Ironman 70.3 Philippines takes to the sea in Cebu as the province hosts its fourth staging as well as the Alaska Milk Ironkids Triathlon on August 4 – 5, 2012. After racing in a man-made lake the past three years participants will swim in open water as the Cobra Energy Drink Ironman 70.3 Philippines holds the 1.2-mile swim part in the sea starting at the beach of the Shangri-La’s Mactan Resort & Spa in Mactan Island. The province of Cebu will literally host the event with the 56-mile bike ride traversing four municipalities ( Lapu Lapu, Mandaue, Cebu City and Talisay). 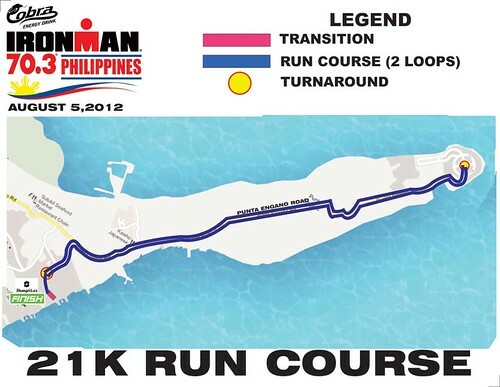 The culminating 13.1-mile run will be at Punta Engano, Lapu Lapu City. Race organizer Sunrise Events, Inc. promises to top the wildly successful races of the past three years assuring that that this year’s race will be its biggest, most exciting edition yet. A huge field of 1,319 individuals and 115 relay teams from 31 countries, with 350 on the wait list, will test their strength and endurance once again as Ironman 70.3 Philippines provides another once-in-a-lifetime triathlon experience. Alaska Milk Ironkids Triathlon on the other hand is for the youngsters. It is the local junior version of the international triathlon series, Ironman. It is open to kids age 6 to 14 years old and aims to promote an active lifestyle for kids to promote their health. Leading the Cobra Energy Drink Ironman 70.3 Philippines are the professional triathletes including back-to-back champion Pete Jacobs of Australia. Jacobs, who has become a regular fixture of the Cobra Energy Drink Ironman 70.3 Philippines, will gun for an unprecedented third consecutive victory after winning the past two editions in 2010 and 2011. He will have his hands full against Cobra Energy Drink Ironman 70.3 Philippines inaugural champion Terenzo Bozzone from New Zealand who won the 2009 race. Other male professionals include Fredrik Croneborg from Sweden, Justin Granger from Australia, Mathieu O’Halloran of Alaska TeamTBB Philippines who now lives in the Philippines and Jesse Thomas from the United States. Defending champion Belinda Granger, also from Australia who is fresh from her triumph at the Century Tuna 5i50 Triathlon in Subic, aims for back-to-back titles against familiar face Bree Wee from the United States who was in third place last year. Ali Fitch of Alaska TeamTBB Philippines from Australia will also be in the mix. The presenting sponsor of the Cobra Energy Drink Ironman 70.3 Philippines is Globe Telecom. The official carrier is the Philippine Airlines. Media partners are MultiSport magazine, the Philippine Star and Studio 23. The event is also sponsored by Alaska Milk Corporation, Century Tuna, David’s Salon, Intercare, K-Swiss, Oakley and Powerade. 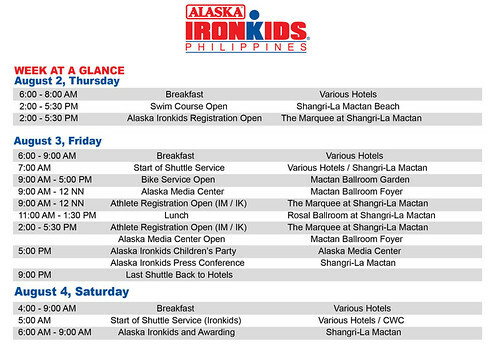 Official photographer is Finisher Pix while the host venue is Shangri-La’s Mactan Resort & Spa. Official hotel partners are BE Resorts, Crimson Resort & Spa, Movenpick Resort & Spa, Radisson Blu. The Ironman 70.3 Philippines has become one of the most-awaited sporting events in the country attracting thousands of participants since its inception in 2009. 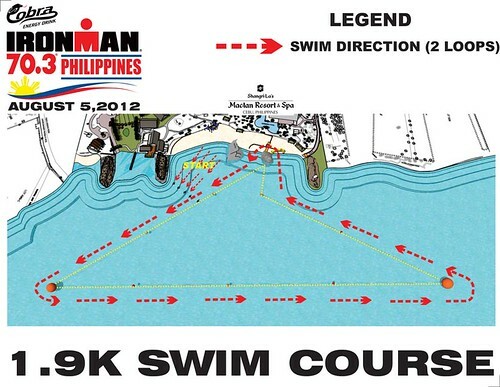 For more information, check out the Cobra Energy Drink IronMan 70.3 Philippines website, www.ironman703phil.com. 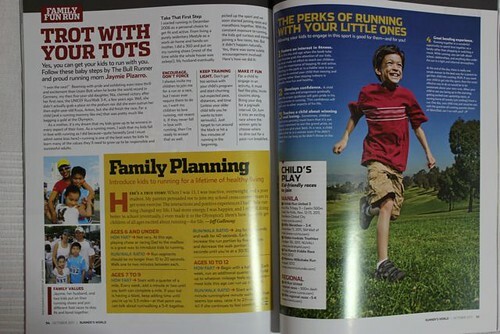 Thanks to Marie Calica, Editor in Chief of Runner’s World, for inviting me to write an article on running with our kids on the October-December 2011 issue of Runner’s World. Get your copy now if you still haven’t! There was a time when there were only a handful of well-organized races to look forward to in our running calendar for the year. One of the top races on that list was the adidas King of the Road. adidas King of the Road will be held in Manila this coming October 23, 2011 at the Bonifacio Global City. 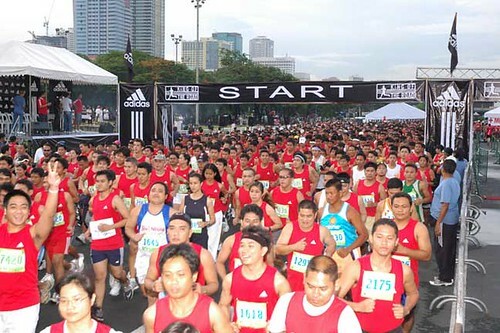 adidas expects 4,000 runners for this event. What makes this adidas King of the Road different is that it will be held in five countries across the region – Thailand, Singapore, Indonesia, Malaysia, and Philippines. Each country is a qualifying leg towards the finals with the winner and runner-up of each country’s 16.8km category winning an all-expenses paid trip to the Philippines (do our Pinoy winners get a trip to all 4 other countries? hmmm) to compete with the best of the best in Southeast Asia. What makes the 16.8km distance special and why this distance? 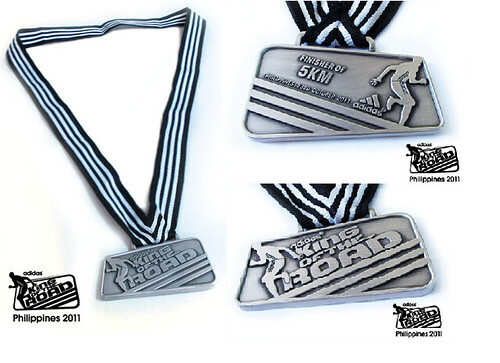 adidas says: “You’ll be able to complete 2 marathons (84km) over five (5) countries with adidas KOTR 2011.” Meaning, 16.8 km x 5 countries = 84 km which is equivalent to 2 marathons. KOTR features a different theme each year, and this year’s theme is entitled ‘Colours’. 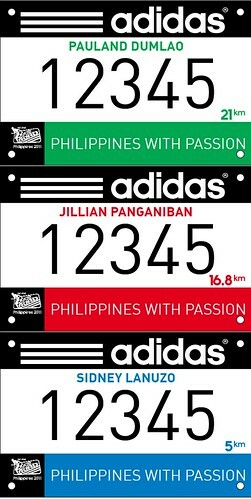 This is represented through the variety of different coloured adidas singlets participants will don. The multi-colour showcase is meant to demonstrate the vibrancy of the sports scene across Southeast Asia. Registration is still open! To register, visit the adidas King of the Road website for online credit card payment or drop by adidas stores for cash payments. Click HERE to download race FAQs.